The Greens also polled more in Brighton Kemptown. The Green Party has doubled its share of the votes in two seats, but failed to win its first Parliamentary seat. The Greens' Keith Taylor came third in their top target Brighton Pavilion with 22% of votes. The Labour incumbent won. But Mr Taylor, who pushed the Lib Dems into fourth place, polled 9,530 - up 13% on 2001's result. In Lewisham they won 11.5% and doubled their vote in Norwich South. The party got 256,020 votes in total, compared with 166,477 in 2001. Overall the Greens, who contested 200 of the 646 seats, won 1.07% of the vote. But they lost the £500 deposit in 177 seats across the UK where they failed to win 5% of votes - amounting to £88,500 overall. Mr Taylor, one of six Greens on Brighton City Council, called the result in Brighton Pavilion "fantastic". He said he did not believe the gains he made in Brighton Pavilion - a key target for the party - were just down to protest votes over Iraq. Mr Taylor, whose party holds the balance of power on the council, said: "We are delighted that a party with principles, funded from the pockets of ordinary people who share our values, can have had such an impact." 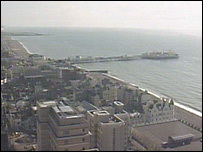 The Greens were placed third in Brighton Pavilion, ahead of the Liberal Democrats, whose candidate Hazel Thorpe polled 16.5% of the votes at 7,171. Mr Taylor added: "There are more elected Greens than ever before, and we are steadily increasing our overall vote as people see what difference radical, principled Greens make in office." The party also hailed their best ever general election performance in Scotland, increasing their vote across the country, but without managing to return an MP. In the 2001 general election the Green Party took 0.7% of the vote with no seats gained.